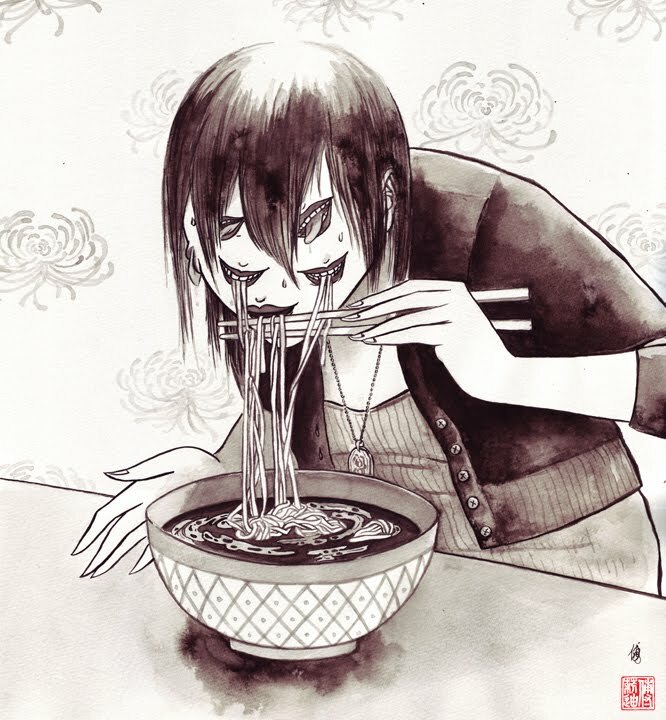 Self Pho-trait by Lydia Fu: 14″ x 16″ Ink, 2010. This was one of the first pieces I did when I decided to pursue illustration. I was really hungry at the time, working at my studio in Chinatown and felt like eating Pho. Rios: What/who inspires you to create? Lydia: Oh gosh, I think everything inspires me, but I guess I go in phases of things I will obsess over. Other than that standard stuff like you know “nature, the universe and everything”, seeing friends and other people make amazing stuff, food and music is huge. Rios: Is art cathartic for you? 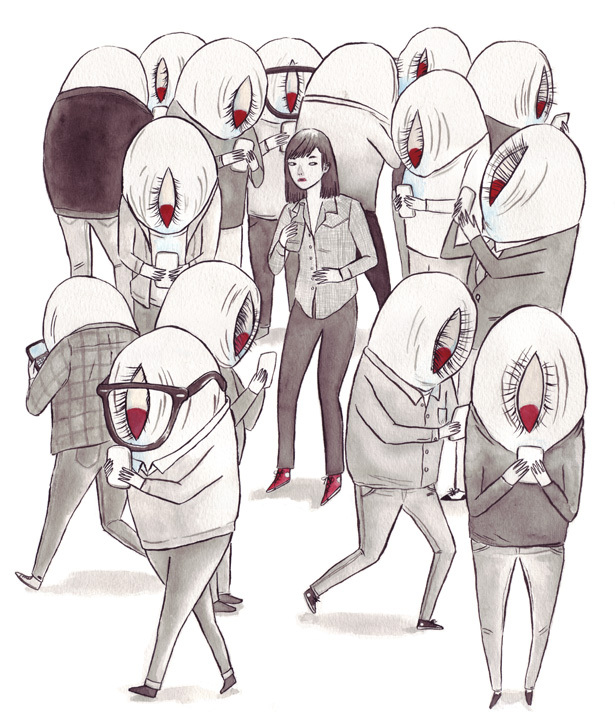 Text Party by Lydia Fu: 16″ x 18″ Ink + gouache, 2010. Slightly before smartphones became ubiquitous – I didn’t have one at the time. Rios: What messages do you want people to receive from your art? Lydia: I think if I can communicate some part of myself and someone else can see themselves in there, that’s really magical. Rios: What have you learned about yourself from being a creator? Lydia: It’s good to be inspired, watch and learn from other artists but at the end of the day it’s just all on me to get it done. 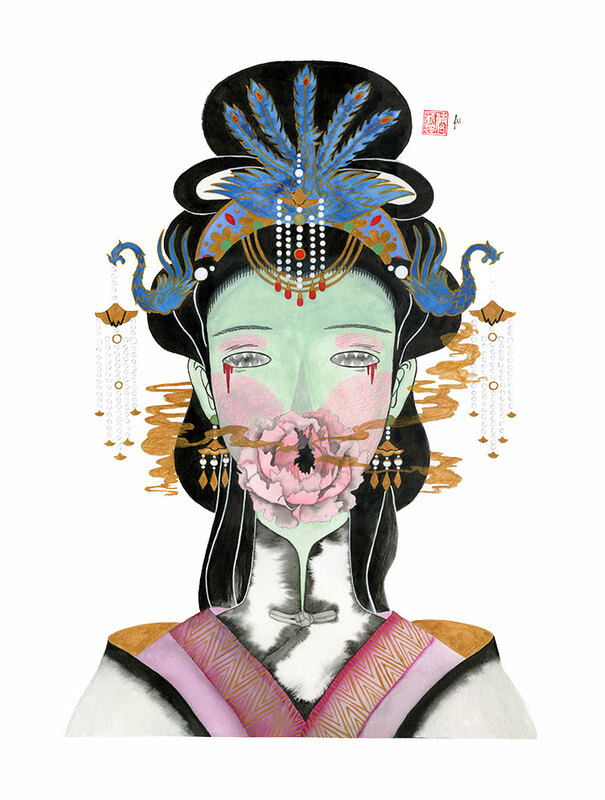 MeiGui by Lydia Fu: 18″ x 24″ Ink, gouache + colored pencils, 2013. I was approached by Ayden Gallery to make one monster and one robot for their annual Robots and Monsters show. This was my monster – mostly issues with identity, sexuality and concepts of beauty. Bio: Lydia is an artist and illustrator based in Chicago. After graduating from the University of Chicago with a B.S. in Chemistry, she then went on to study at Emily Carr University in Vancouver, BC where she received a B.M.A. in Animation. She loves to tell stories and create things that combine her love of old and new media. She also has late night sketch parties with her cat BaoBao. See more of Lydia’s work HERE and HERE. Read her rad comic series HERE.